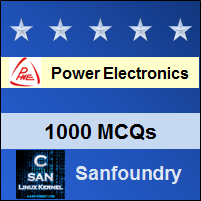 This set of Power Electronics Multiple Choice Questions & Answers (MCQs) focuses on “Cycloconverters”. Explanation: A cycloconverter converters input power at one frequency to output power at a different frequency with one-stage conversion. Explanation: Speed of induction machines can be controlled by controlling the input frequency. In induction heating, eddy current is proportional to the square of input frequency. 3. The single phase mid-point type cycloconverter uses __________ number of SCRs. Explanation: 2 negative and 2 positive SCRs are employed in mid-point type cycloconverter. 4. 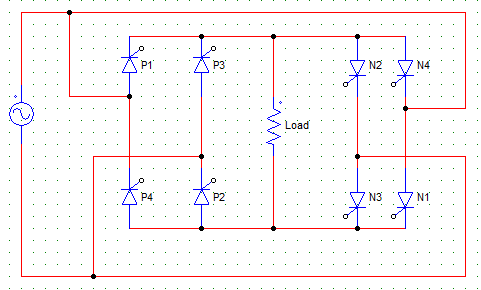 The single phase bridge type cycloconverter uses __________ number of SCRs. 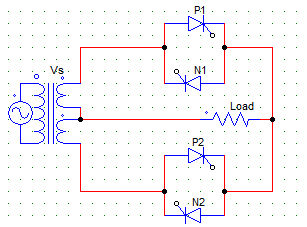 Explanation: 4 negative and 4 positive SCRs are employed in bridge type cycloconverter. Explanation: In the positive half cycle, upper terminal is positive of the upper secondary and the lower terminal is negative for the lower secondary. Hence, P1 and N2 are forward biased. 6. In the below given cycloconverter circuit, _________ and _________ conduct in one cycle together. Explanation: In the positive half cycle, upper terminal is positive of the upper secondary and the lower terminal is negative for the lower secondary. Hence, P1 and N2 are forward biased. And likewise, N1 and P2 will conduct in the next half cycle. 7. In the positive half cycle, _________ SCRs are forward biased. Explanation: Pairs P1, P2 and N1, N2 are forward biased from ωt = 0 to π. Explanation: The basic principle of three phase cycloconverter is to vary progressively the firing angle of the controlling devices. Explanation: Reduction factor = output frequency/input frequency. Explanation: During the conversion process, the current flows in both the directions, hence both inverting and converting action takes place.